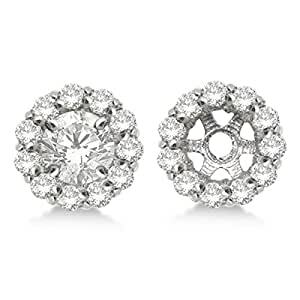 These diamond earring jackets turn your favorite posts into a sophisticated pair of diamond earrings that cannot be ignored. Twenty six brilliant cut diamonds of G-H and SI clarity encircle each diamond stud with sparkle for a total of 1.12 carats. 14k white gold diamond jackets can hold your diamonds of approximately 9mm. Studs are not included.